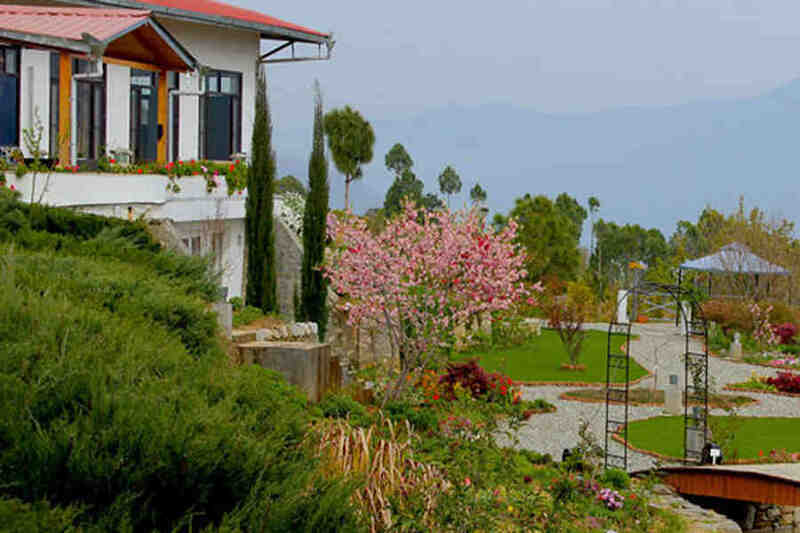 Use the form below to inquire about Serene Hill Resort At Darmani Ranikhet . Use the form below to reserve for Serene Hill Resort At Darmani Ranikhet . These are spacious rooms with king size beds, attached bathrooms, and rain showers. This room has a queen size bed, a single bed, and rain shower in the bathroom. The East room has a king size double bed and an attached bathroom. 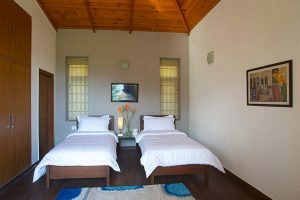 The West room has 2 single beds (which can be combined to form a king size double bed) and its own attached bathroom with hot & cold shower. Air Conditioned Room, Hot and Cold Running Water, TV with cable connection in each rooms. 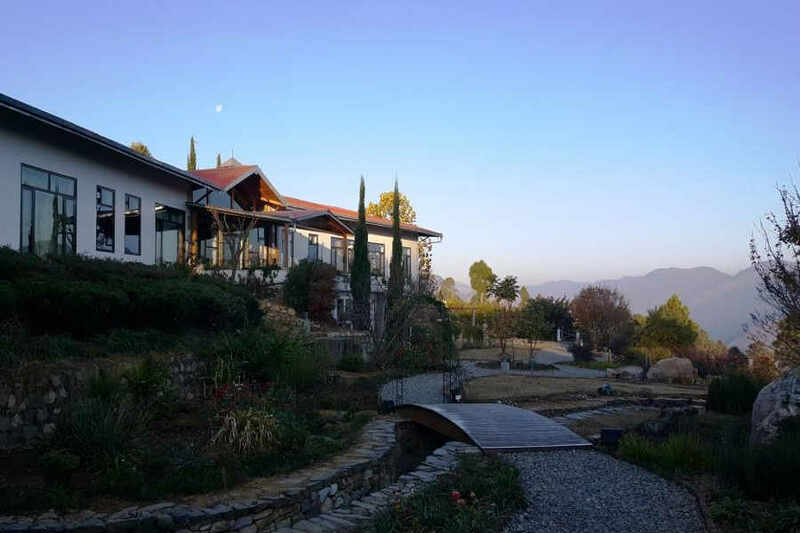 Cut yourself off from the world at this Serene Hill Resort At Darmani, a remote village sitting high in the Kumaon Hills. 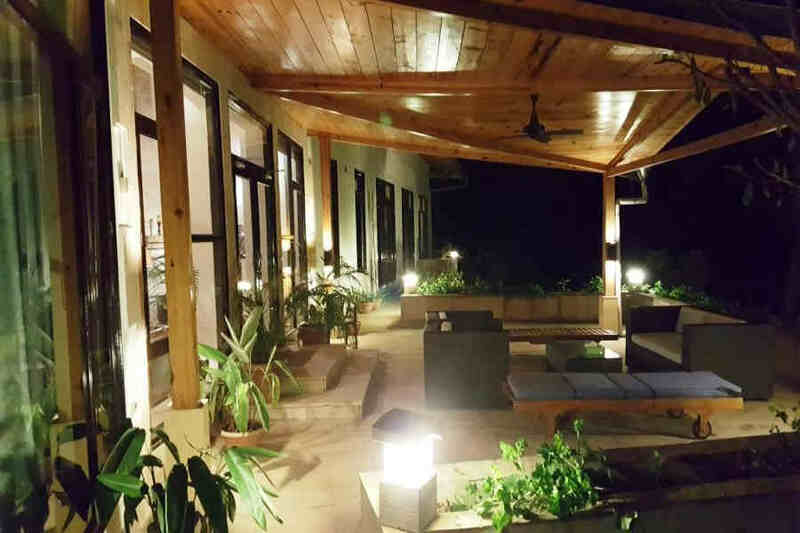 This Serene Hill Resort At Darmani is one of the best-kept secrets of the hills. 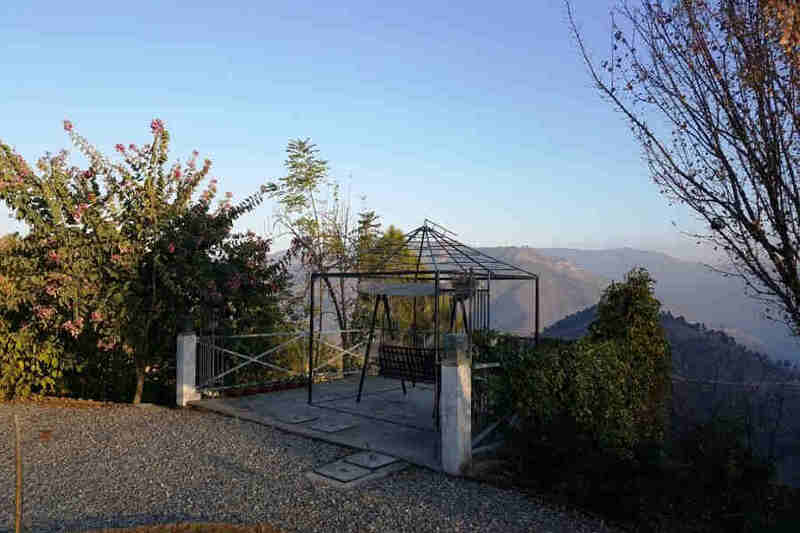 In the small hamlet of Darmani, about 4,500 feet above sea level, this charming hideout beckons to you. Some of the notable peaks of the Himalayan Range like Nanda Devi and Mount Trishul are visible from this resort. The exterior of this Serene Hill Resort At Darmani is spectacularly designed with wooden and contemporary elements. 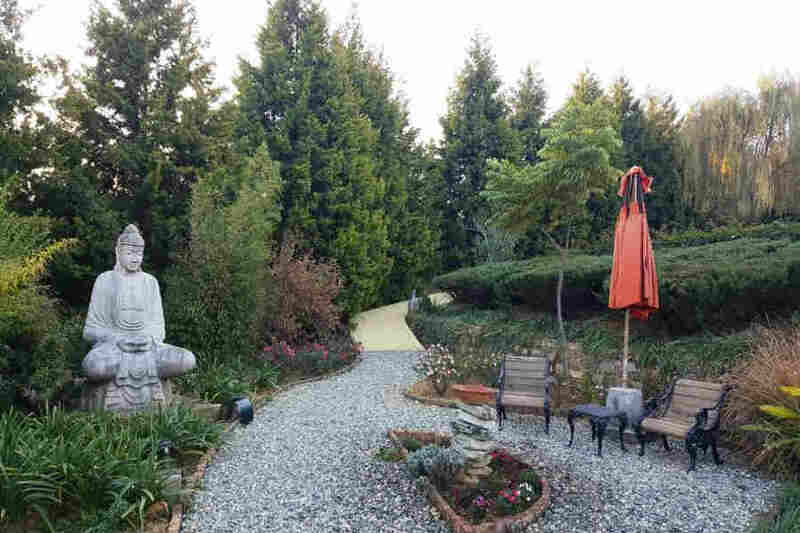 The landscaped garden is a great place to become one with nature. 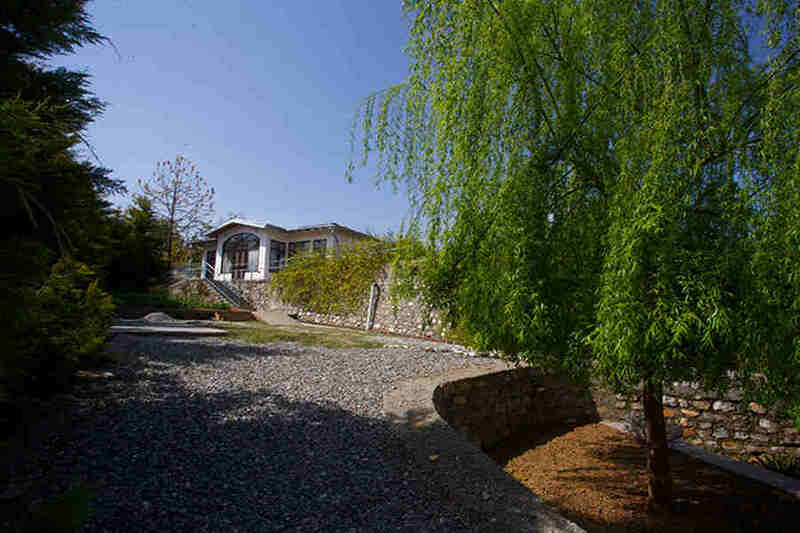 The fish pond and the room deck are perfect nooks to cozy up with a book. 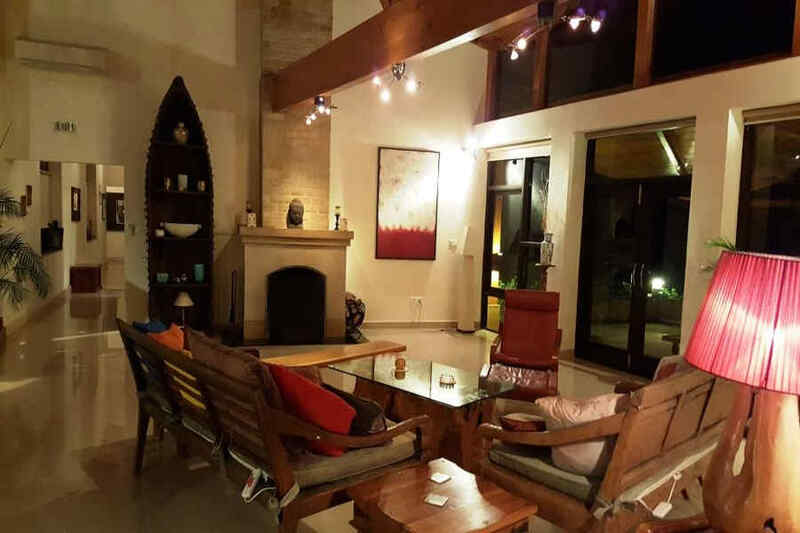 The airy and glazed drawing room with a covered deck offers stunning views of the Himalayan peaks. This family recreation area has timber clad ceilings, wooden embellishments, and an electrically heated floor. An open fireplace and a wood-burning cast-iron stove give it a rustic ambiance. 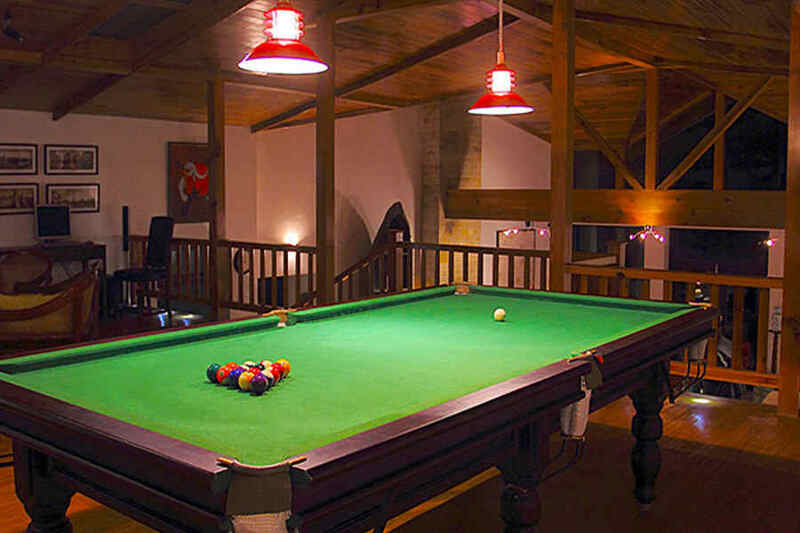 A pool table sits on the sky lit mezzanine floor. The gym is sure to excite those keen on staying in shape. The large dining area has huge glass windows that let in natural light and views of the mountains. The fully furbished kitchen serves up delicious Indian and Kumaoni delicacies for you to enjoy as you gaze upon the panoramic vistas. The rooms in this Serene Hill Resort At Darmani have doors and windows that open to heavenly views of the mountains. 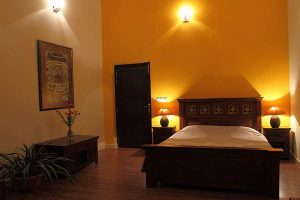 Three luxurious rooms are available for guests and electric blankets are provided. Two extra rooms in the annex are only for groups that need more than three rooms. 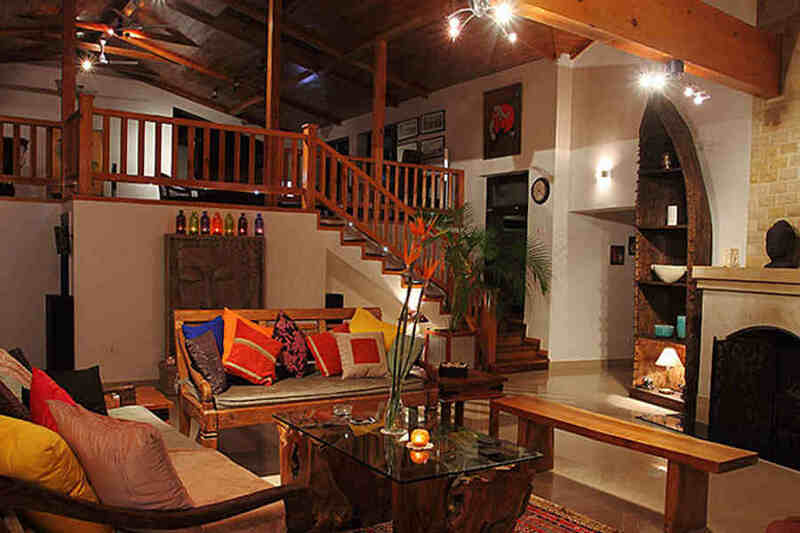 An ideal spot to recharge your creative energies or simply chill out with near and dear ones! Annexe Rooms are to be sold only if the other three rooms are occupied. 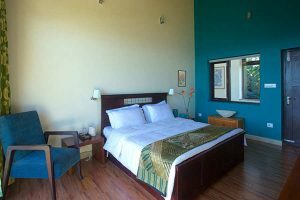 Apart from pampering yourself in the serene ambiance of the resort by just relaxing or curling up with a book, there are other activities such as a swimming pool, massages, and a gym that you can choose from. Step outside the premises for an unforgettable experience in the pristine mountain air. If you happen to have an adventurous streak, go trekking through rugged mountain trails twirling through small villages all the way down to the stream at Garampani. The staff from the resort can help and arrange for local guides if requested in advance. In Ranikhet, the Bazaar Area is a popular destination with tourists for shopping. Pay a visit to the ancient Jhula Devi Temple where the deity Goddess Durga sits on a swing. Chaubatia Gardens is just a few kilometers from Ranikhet and is popular for its apple orchards and exotic flower gardens. A peaceful walk viewing the snow capped peaks is a quintessential activity when in Ranikhet. Ranikhet is the base camp of the Kumaon Regiment and the military museum chronicles their history in full. Pantnagar airport is the closest from the resort and is at a distance of 98km. Dehradun airport is second closest at 314 km. Indira Gandhi International Airport, New Delhi, is 341 km away. Kathgodam railway station at 70 km is the closest railway while New Delhi railway station is away at 329 km. Ranikhet town is 36 km away along Ranikhet road while Nainital town is 40 km away via NH 109. New Delhi is 329 km via NH 9.